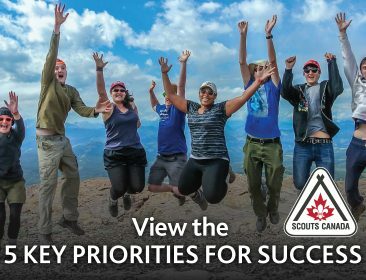 In the last year, the 186th Ranchlands Scouting Group grew by 61.9%, increasing from 21 to 34 youth members. Their secret? Planning amazing urban adventures and community building. Christopher Tindall, Group Commissioner, took the time to explain their success to Scouts Canada. Additionally, the Group takes advantage of the wooded areas in the neighbourhood all year round. In the winter they go snowshoeing, and in the summer months they hike and build bird houses. These indoor and outdoor urban adventures have attracted new members and kept others coming back, year after year. The 186th Ranchlands Group’s youth-led mentality has helped keep members involved and eager to return to gain even more from the program. Even the Beaver programming is youth driven by letting them draw what adventures they would like to participate in. Our youth really enjoy community building and giving back which has helped drive membership. Nothing can stop the 186th Ranchlands Group from growing even further. To them, adventure is everywhere, from a community centre swimming pool to a wooded area in the city. So what is Scout Guide Week all about?